The best laptop cooling pad is the Havit HV-F2056 . With the massive decline in PC sales we’ve seen over the past couple of years, it’s no wonder that so many people are debating whether the PC is doomed to be replaced by laptops or tablets. One thing that’s certain it that today we expect more from our laptops than ever as we move towards portable solutions to high-performance computing needs. This leads to a fundamental problem: How do we deal with the heat that is generated when are laptops are working under high-demand scenarios? The more integral that a laptop is to our passions or professional endeavours, the more likely that we will be placing higher demands on it. And the higher the demands we place on our laptops, the more heat they produce. Besides being bad for your laptop, overheating can be just plain frustrating, especially if it leads to loss of data or to a shut-down in the middle of a big project. It’s a problem faced by laptop users all over the world. Enter the laptop cooling pad. Cooling pads are a solution to the overheating crisis designed to help keep your laptop running safely and effectively even in high-demand scenarios. They provide a ‘pad’ for your laptop to sit on, which contains fans that blow to keep the bottom of your laptop cool. Sounds like a great idea, right? Unfortunately, not all cooling pads are created equal. There are many, many brands and models on the market and a wide range of effectiveness from one to another. Some are highly efficient at what they do while others are essentially a waste of money. To help you narrow down your search and find an effective, worthwhile solution to your overheating problems, we’ve gathered feedback and research from across the industry to compare many coolers and bring you the Top 5. Laptop cooling pads are great because they help us to get the most of our laptops. They can be a help or a hindrance depending on a number of factors and features. We collected feedback from users, reviewers, and tech experts to find the most important considerations for buying a laptop cooling pad. We determined this final list by analysing the feedback we gathered to find out what mattered most to actual users of laptop cooling pads. While all of the features we’ve listed play a big role in how usable your laptop cooling pad is, some are more important than others. The most important by far is airflow. If airflow is poor, your laptop doesn’t get cooled down and you’ve essentially wasted your money. Airflow is often measured in CFM, or cubic feet per minute. However, a high CFM number on its own isn’t enough to guarantee that airflow is effective. For example, some laptops with lower CFM but excellent fan and vent alignment may do better at cooling down your laptop than cheap, misaligned coolers with higher CFM. The type of fans and their rotation speed also play an important role in airflow. Therefore the overall effectiveness of your laptop cooler is dependent on a combination of factors that contribute to the quality of your airflow. A vital component of a laptop cooling pad’s capacity for cooling is its fans. Laptop coolers come with wide variety in how many fans are in place, how big they are, how fast they spin, how much power they consume, and the distribution of airflow that they create. In general, more fans create a greater level of air distribution. However, a single large fan can also create good distribution depending on the quality of the fan and how efficiently it operates. When deciding whether the fans on a laptop cooling pad will meet your needs, you should take into account how many fans are present, how much power they consume, their position within the frame, and the distribution of airflow that they create. Adjustability is another important feature to consider when choosing your cooler. If you only use your laptop on a flat surface such a desk or tabletop, then adjustability may not be a big deal. However, many people use laptops in any number of positions—sitting on the couch, the bus, the train, outside at a park, lying down, etc. In these cases, being able to adjust the angle of your keyboard can go far towards how comfortably you are able to use your laptop. Many laptop coolers keep this in mind and provide different levels of adjustability. We recommend choosing a laptop cooler with at least two heights to choose from in order to be able to type comfortably from multiple angles. No one likes to hear obvious noise coming from their laptop, and the same applies to laptop coolers. A noisy cooler can be obtrusive and distracting when you are trying to get work done. It can be embarrassing as well, drawing unwanted attention in public places and earning you the dirty looks of your fellow focusers. Fortunately, laptop coolers overall tend to do a pretty good job in the noise department. While some can be quite loud, good cooling pads average only about 24 dbA. Still, the quieter the better when choosing a laptop cooler. Many people who use laptop cooling fans do so because they place high demands on their laptops, pushing them hard. It’s not unusual for these same users to want to plug in extra devices to promote multitasking and extend functionality. Most laptop coolers power themselves by plugging in to your laptop with a USB connection, so you’ve already lost use of one of your laptop ports by plugging in the cooling pad. User feedback indicates that having extra USB ports is an important consideration for many users. We recommend choosing a laptop cooler with at least one additional USB port to make up for the one that you’ve lost by plugging in the cooler. After careful consideration and comparison on each of these five features, the winner for #1 Laptop Cooling Pad is the Havit HV-F2056 . The HV-F2056 cooling pad is a top choice amongst those who need to cool their laptops in high-performance contexts such as gaming or intense multitasking. This cooler provides truly effective airflow at 65 CFM, supported by three 110mm fans that reduce noise and effectively distribute cooling power. This cooling pad is height-adjustable and comes with an extra USB port to make up for the one that’s needed to plug the cooler into your laptop. Overall, the Havit cooling pad is our top choice because of its superior airflow in terms of both CFM and distribution by its four fans. Based on feedback that we gathered from users of this device, it more than meets expectations at an affordable price. The Tree New Bee came in second because of its all-around versatility and high-quality airflow. It offers outstanding cooling capacity, with air being directed by four 120mm fans running at up to 1200 RPM. These fans keep noise down to 22 dBA while still delivering excellent airflow. There are two fan speed adjusters to give you greater control over your cooling power. The cooling pad is also height-adjustable, giving you more choices for the angle of your keyboard. An extra USB port means you won’t have to sacrifice one of your peripheral devices just to run your cooler. Ultimately, the New Bee got the second spot for best laptop cooler because the Havit HV-F2056 has slightly better airflow, but it’s is still a great all-around pick in terms of airflow, versatility, and extras like an additional USB port. Third on our list of the Top 5 best laptop coolers is the Cooler Master NotePal X3. This gaming laptop pad supports the highest-needs users with airflow between 65 and 76 CFM, produced by a single high-performance 200mm fan. The fan is reasonably quiet at 23 dBA. Fan-speed control and height adjustability make this another versatile choice for those in need of a laptop cooler. The additional USB port is a great addition to keep your functionality intact. Although this laptop cooling pad is an excellent choice for high-performance users, it came in third on our list because we found that the single fan was slightly less efficient at distributing airflow than the multi-fan configurations of our top two picks. Nevertheless, the Notepal X3 performs highly and is an excellent choice for those looking for an all-around great laptop cooler. Cooler Master makes great cooling products, and we couldn’t help but include another Cooler Master laptop cooler on our list. The NotePal X Slim came in fourth, beating out many other laptops that we compared in the course of our analysis. The NotePal features a single 160mm fan that runs at a quiet 21 dBa. Airflow clocks in at up to 70 CFM, making it an excellent contender for any spot on our list. This cooler solves the USB problem by offering a USB cable with a pass-through. This is another good solution, although the downside is that if you lose your pass-through cable you’ve effectively lost that extra USB functionality. Height is adjustable in two stages using moveable pegs. This laptop cooler performs well overall. Users report high satisfaction with the Cooler Master Notepal X Slim, however it came in fourth on our list due to its slightly more limited USB offerings. High-performance users are more likely than anyone to need that USB port, and we’d like to see one built into the cooling pad itself. Coming in last on our list is the Targus HD3 Gaming Chill Mat. The HD3 provides highly effective cooling power, beating out many other devices that we compared. This cooler is marketed towards high-performance gaming laptops, and it does an excellent job supporting the needs of heavy gamers who push their laptops to the limit. Airflow is supported by three 80mm fans. Speed is adjustable up to 3000rpm, so you can choose how hard to run your cooler based on your needs. The cooler also uses advanced airflow straighteners to make sure the air is getting where it needs to go. Great airflow results in a reported temperature drop of 10-15 degrees C, which is fantastic for this kind of device. In addition to great airflow, the Targus HD3 runs quietly at 23 dBA. In the end, the Targus HD3 came in last because it doesn’t offer additional USB ports or adjustable height. However, the excellent cooling capacity of this laptop, especially in high-performance contexts, along with its slender build and portability, guaranteed it a spot in our Top 5 list. Our #1 Pick is the Havit HV-F2056. The HV-F2056 placed first due to its superior combination of airflow, air distribution, and user control. 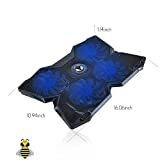 That being said, the other four choices on our list are also top-notch choices for laptop cooling pads and any one of them may be best suited to your individual needs. They each represent an excellent combination of high performance, excellent levels of user satisfaction, and reasonable price tags. Laptop cooling pads can make your laptop more useable, but it’s important to keep in mind a number of factors to choose the best one for your situation. Airflow is the most important consideration, but this consideration must be balanced with other needs such as noise level and fan configuration. In the end the Havit offered the best balance of all such features. However, the other four laptop coolers on our list are also excellent picks for supporting the life of your device through any number of high-performance scenarios.